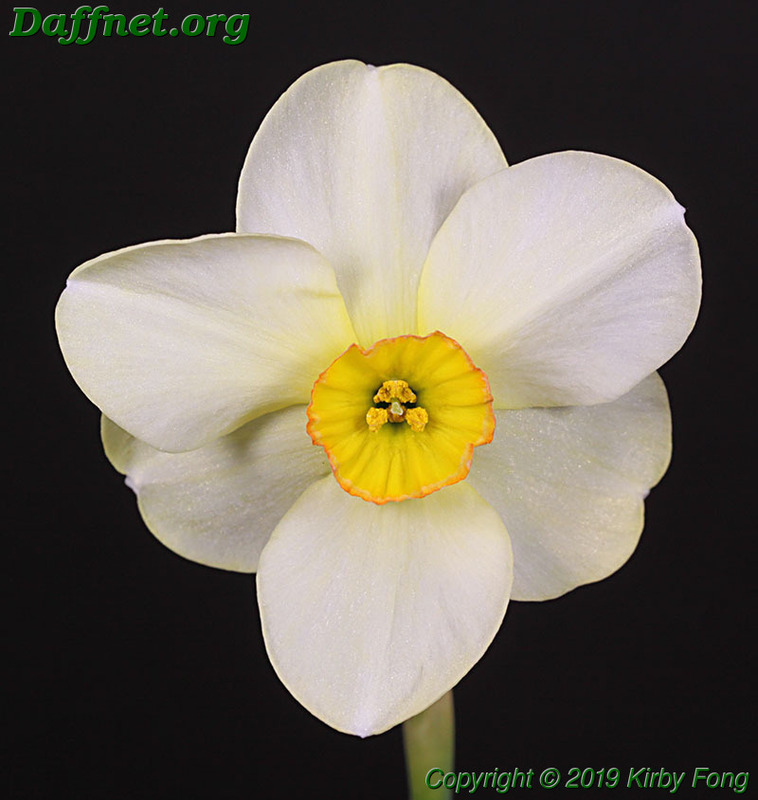 I attended the Oregon Daffodil Society (ODS) show at the Crystal Springs Rhododendron Garden in Portland, Oregon this weekend. Various events conspired to make this a smaller show than usual. 12 exhibitors made 159 entries with a total of 375 stems. 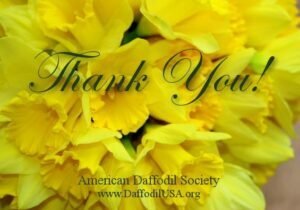 This posting will cover all the American Daffodil Society awards that were actually awarded and three local awards of some interest. 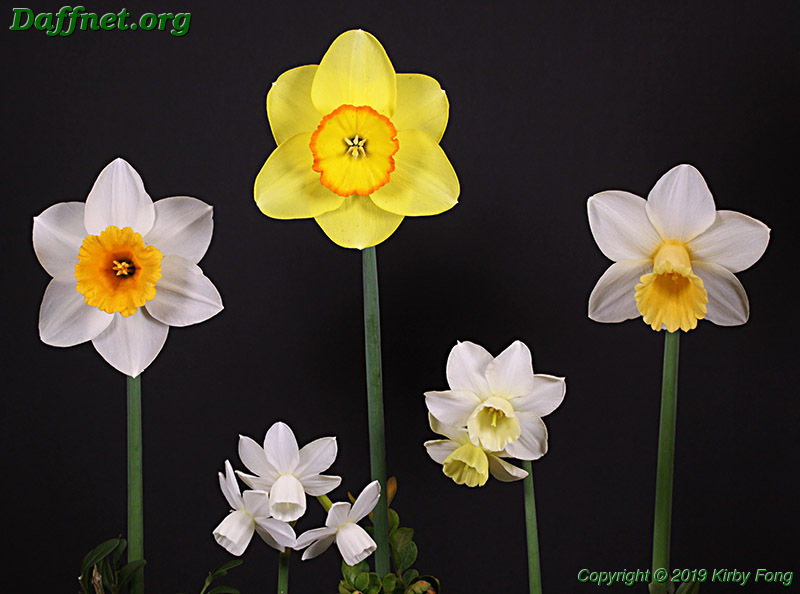 Despite the reduced number of stems, there were some very good ones as exemplified by the final three candidates for the best standard daffodil. 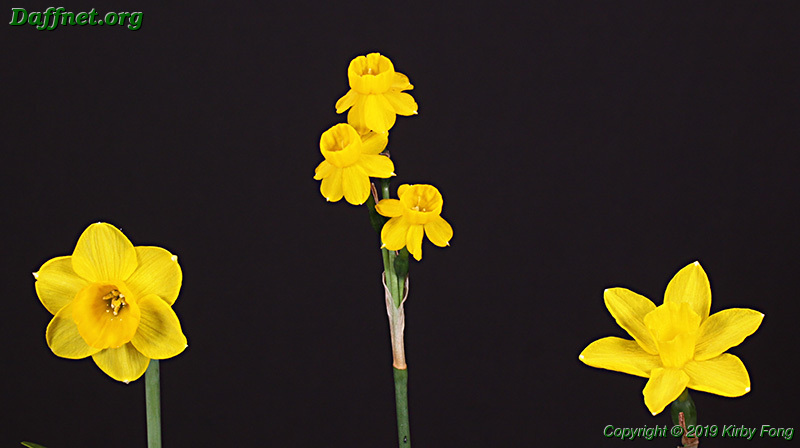 After most of the candidates for the Gold Ribbon were eliminated, these three very different blooms were left to fight it out. They were of such high quality that it was difficult for the judges to pick one. But the judges finally settled on one, and here it is, ‘Euphonic Bells’ 5W-W exhibited by Elise Havens. 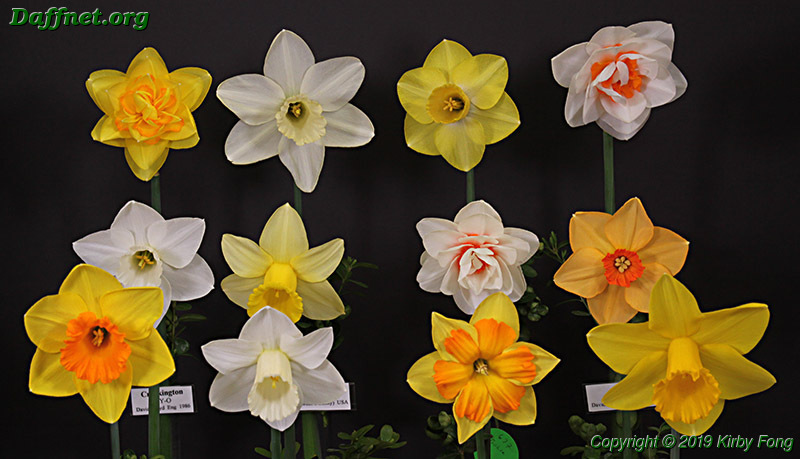 The Gold Ribbon is for the best standard daffodil in the show excluding the Container-Grown Section. Let’s continue in show report order. 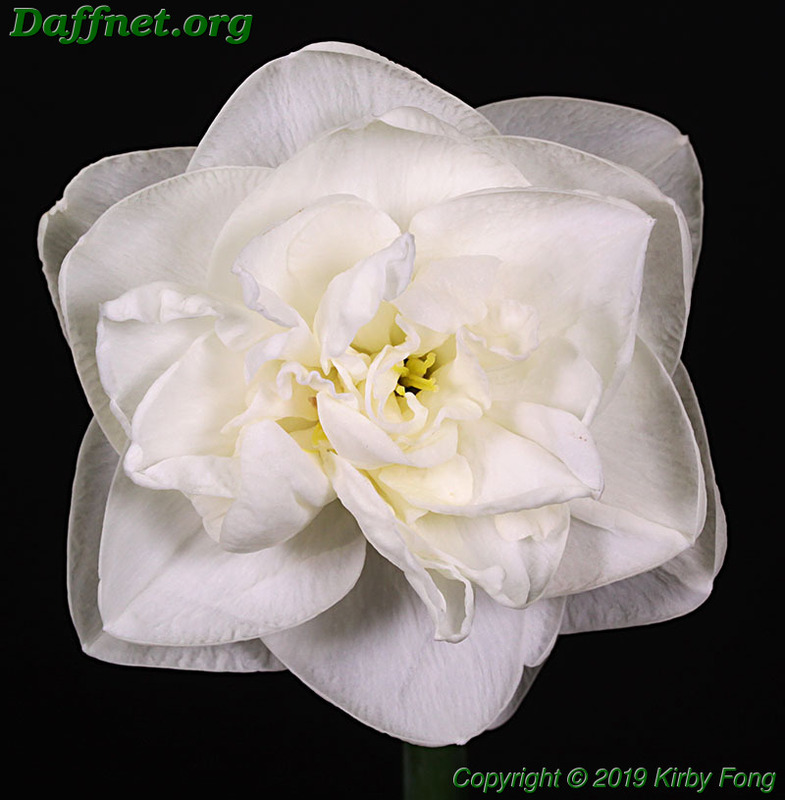 The Rose Ribbon is for the best standard seedling in the show (excluding the Container-Grown Section) exhibited by its originator. 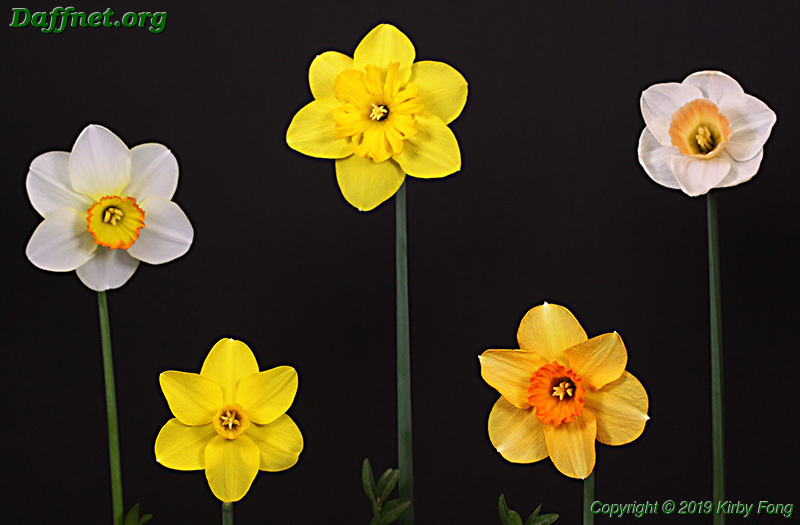 The Intermediate Ribbon is for the best daffodil in the Intermediate Section or in the standard collections. The winner of both was seedling V11-16-2 2Y-Y exhibited by Steve Vinisky. You can’t tell from the photo, but this was clearly a small flower though obviously larger than a miniature. The Miniature Gold Ribbon is for the best miniature in the show (excluding the Container-Grown Section), and the miniature Rose Ribbon is for the best miniature seedling exhibited by its originator. The winner was seedling V11-6-30 2Y-Y exhibited by Steve Vinisky. What’s interesting about this miniature is how broad the perianth segments are so that they achieve good overlap. The White Ribbon is for the best set of three standards, and the Best Intermediate Three-Stem Ribbon is for the best set of three intermediates. Winner of both awards was seedling V07-36-8 2Y-YYR exhibited by Steve Vinisky. The Miniature White Ribbon is for the best set of three miniatures in the show. The winner was V05-10-2 2Y-YOO exhibited by Steve Vinisky. The best bloom in the Historic Section was ‘Chinita’ 8Y-YYR (1922) exhibited by Theresa Fritchle. Yes, we’d like to see more florets on a tazetta, but remember this was a small show. 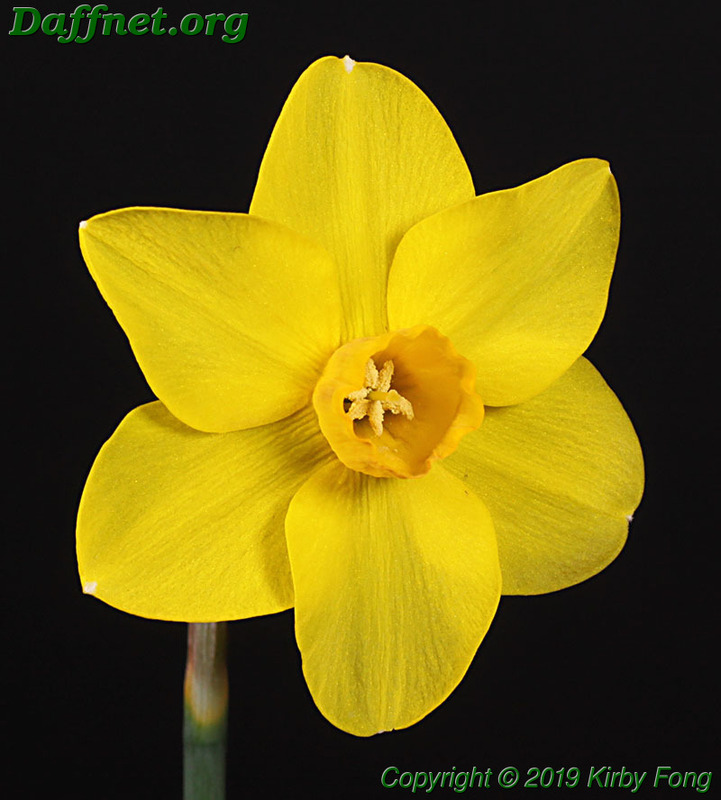 Historic daffodils are cultivars registered before 1940. The best set of three in the Historic Section was ‘Thalia’ 5W-W (1916) exhibited by Theresa Fritchle. 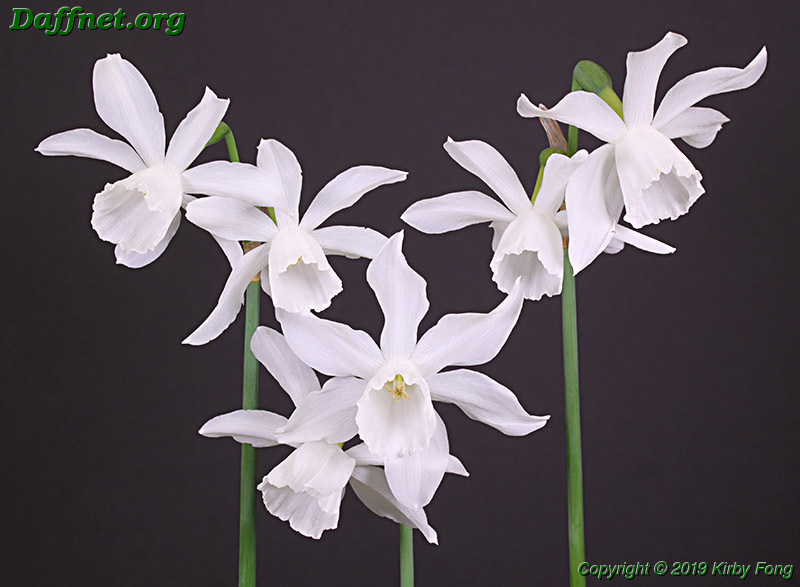 The best bloom in the Classic Section was ‘Gay Song’ 4W-W (1968) exhibited by Peggy Tigner. 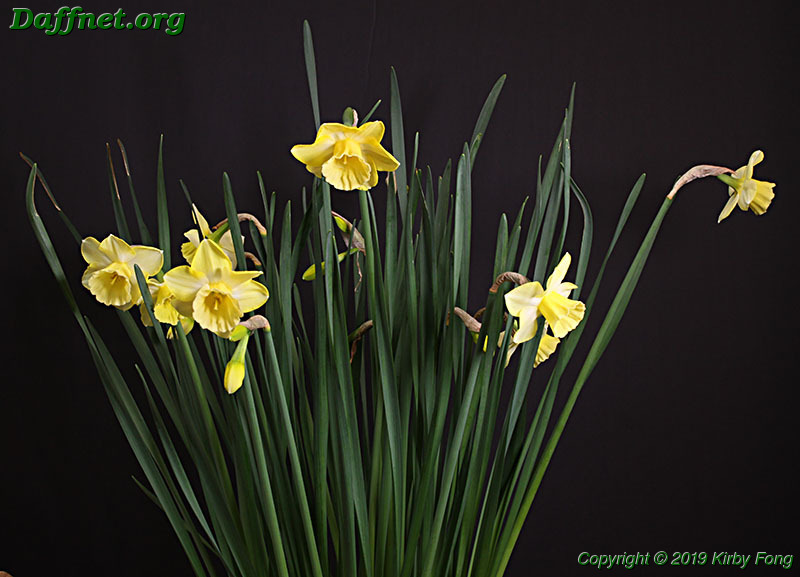 Classic daffodils are those registered between 1940 and 1969 inclusive. In addition to an award for the best bloom in the Historic Section, the ADS also has an award for the best single-stem exhibit in the Historic Section. The winner of this latter award was ‘Sir Winston Churchill’ 4W-O (1966) exhibited by Peggy Tigner. The best set of three in the Historic Section was ‘Avalanche’ 8W-Y (1955) exhibited by Theresa Fritchle. The Small Growers Section is restricted to exhibitors who grow 50 or fewer different cultivars or species. The best bloom in this section was ‘Thalia’ 5W-W exhibited by Joanne Turner. The best pot of a standard cultivar was this ‘Lemon Honey’ 2YYW-YYW exhibited by George Armantrout. Front: ‘Chinita’ 8Y-YYR (1922), ‘Gloriosus’ 8W-O (1883), ‘Elvira’ 8W-YYO (1902). The exhibitor was Theresa Fritchle. Front: ‘Pipit’ 7YYW-W (1963), ‘Sir Winston Churchill’ 4W-O (1966). The exhibitor was Peggy Tigner. Front: V11-16-2 2Y-Y, ‘Cayenne’ 2Y-R. The exhibitor was Steve Vinisky. Front: ‘Euphonic Bells’ 5W-W (Havens), ‘Proliferation’ 7W-W (Havens). The exhibitor was Elise Havens. The ‘Euphonic Bells’ in this collection won the Gold Ribbon. The exhibitor was George Armantrout. Bottom row: ‘Boslowick’ 11aY-O, ‘Estuary’ 2W-GWW, ‘Phil’s Gift’ 1Y-Y, ‘Broomhill’ 2W-W, ‘Hot Gossip’ 2Y-O. 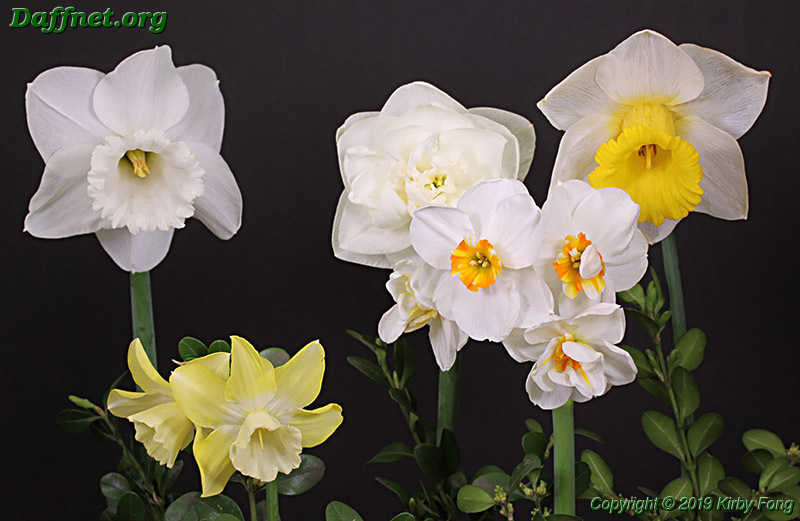 This class calls for three miniature daffodils hybridized and originated by the exhibitor. Flowers in the winning exhibit are: V05-10-11 2Y-YYO, V07-6-34 7Y-Y, V08-9-1 2Y-Y. The exhibitor was Steve Vinisky. V11-6-30 2Y-Y, V05-10-11 2Y-Y, V07-6-34 7Y-Y, V07-81-6 8W-P, V08-9-1 2Y-Y, V11-109-20 2Y-Y. 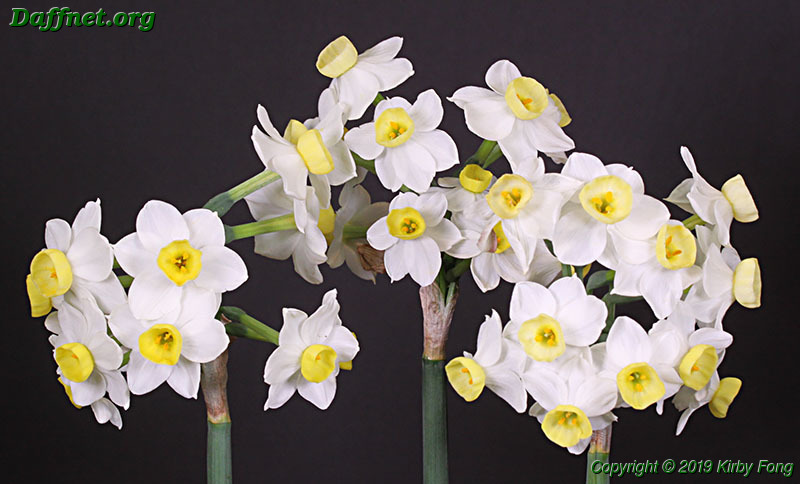 The Oregon Daffodil Society has three challenge classes similar to those at the national show. 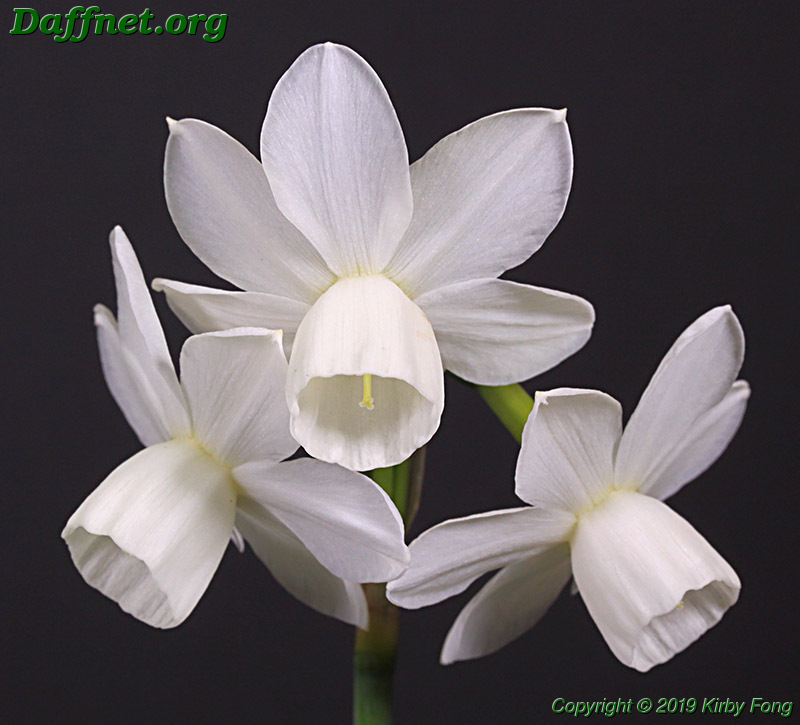 The flowers in an entry must be hybridized by the same person, and that person is the “exhibitor” regardless of who actually grew and entered the flowers. Of course it’s almost always the case that the hybridizer is the exhibitor. A difference between the ODS and ADS challenge classes is that the ODS flowers must be grown outdoors and are therefor eligible for the Gold and Rose Ribbons. As with the ADS challenge classes, there are three classes, one for three cultivars, one for six cultivars, and one for twelve cultivars. The flowers in the winning exhibit are: V10-15-29 11aW-P, ‘Katie Page’ 2Y-YPP, ‘Petticoat Junction’ 2W-P. The exhibitor was Steve Vinisky. ‘Euphonic Bells’ 5W-W, ‘Spring Grace’ 2YYW-Y, SH32/2 2Y-Y, QH23/4 2Y-Y, ‘Confidential’ 2Y-Y, 1ZH25/3 7W-W. The ADS Silver Ribbon is not awarded to an exhibit but is awarded to the exhibitor who wins the most blue (first place) ribbons in the show. 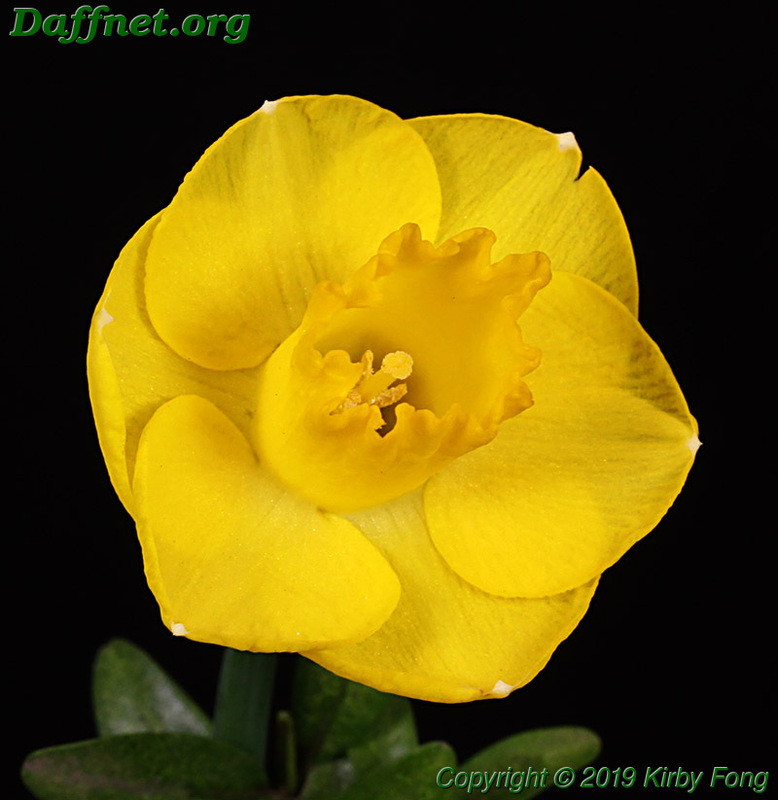 The winner at the 2019 Portland daffodil show was Peggy Tigner with 18 blue ribbons. If an ADS award was not mentioned, that means it was not awarded because there were no eligible entries.